Azure Storage containers is the new custom endpoint type available with IoT Hub. 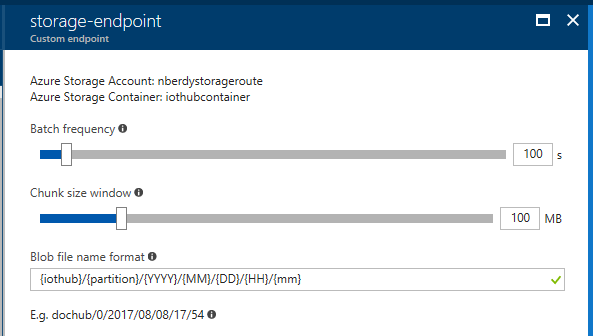 Azure Storage containers joins Service Bus queues, topics, and Event Hubs as supported custom endpoint types for IoT Hub message routing. Storage was the most requested endpoint type for message routing because it makes it super simple to build a cold-path analytics pipeline. The best part, it’s available everywhere. Just as a reminder, IoT Hub can write messages to multiple endpoints, so with this feature improvement customers can both send the message through a hot-path analytics pipeline, as well as push the message to storage for cold-path analytics or long-term archival. Cold-path analytics are used to process data which requires more complex processing than simple windowing or thresholding, and cold-path analytics often uses data from devices over a longer period of time. With this feature update, you can set up your hot- and cold-path analytics easily in IoT Hub routes. With an Azure Storage container as a custom endpoint, IoT Hub will write messages to a blob based on the batch frequency and block size specified by the customer. After either the batch size or the batch frequency are hit, whichever happens first, IoT Hub will then write the enqueued messages to the storage container as a blob. You can also specify the naming convention you want to use for your blobs, as shown below. This feature was brought to you in part by the outpouring of feedback we received requesting the ability to route messages based on message body, and I want to send a huge THANK YOU to everyone who requested this functionality. As always, please continue to submit your suggestions through the Azure IoT User Voice forum or join the Azure IoT Advisors Yammer group.